George A. “Bud” Frazer (1864-1896) – The son of George Milton Frazer, Arizona Ranger and Pecos County, Texas Judge, Bud was born at Fort Stockton, Texas on April 18, 1864. When Bud was just 16 years-old, he enlisted in the Texas Rangers and later served as a deputy sheriff in Pecos County. Even though the family was headed by the esteemed Judge George M. Frazer, they were known throughout the area as a violent family. In the 1880’s, the Frazers were in a feud with their neighbors, the Sosa family. On June 29, 1885, Bud killed a man named Crispin Sosa, after Sosa had slashed the throat of his brother, Jim Frazer. As Jim bled to death, another Sosa family member named Pablo fled the scene. When the Frazers learned that Pablo was hiding in Presidio, Texas they sent an unnamed avenger after him. Pablo was then killed, his body hacked to pieces and fed to hogs. 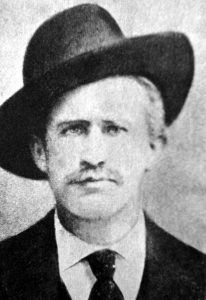 The feud and the killings; however, didn’t seem to affect Frazer’s reputation too much, as five years later, when he was just 26 years-old, he was elected as Reeves County Sheriff in 1890. A year later, the young sheriff made a very bad mistake when he hired the infamous killer, James Miller as a deputy. In those days, it was esteemed to be rude to ask too many questions of one’s past and lawmen were often hard to find in frontier towns. Miller soon moved his family, along with brother-in-law, Mannie Clements, to Pecos, where the family attended church, and by all appearances, were an upstanding group. 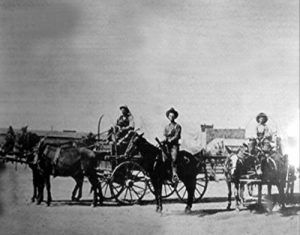 At about the same time, cattle rustling and horse theft increased up and down the Pecos Valley and Miller spent much of his time in pursuit of the thieves. But, when he never captured any, it raised suspicious in the mind of local gunfighter and hard-case, Barney Riggs, who just happened to be Bud Frazer’s brother-in-law. As the increase in thefts had started to occur at just about the same time as Miller became a deputy, Riggs pointed out that perhaps Miller should be looked at as a suspect and suggested the Miller be fired. When Frazer confronted his deputy, Miller laughed off the accusation. Miller, who was supported by members of his church and with no proof of the allegations, was kept on by Frazer and continued his service as a deputy. However, when Miller killed a Mexican prisoner who was “trying to escape,” Frazer began to investigate. Barney Riggs alleged that Miller had murdered the man because he knew where the deputy had hidden a pair of stolen mules. When Frazer found that Riggs was correct and located the stolen mules, he immediately fired Miller. This would be the beginning of the deadly Frazer-Miller feud, which would last for the next several years. In May, 1893, Sheriff Frazer was away on business and Miller’s criminal element virtually took over the town. In the meantime, Miller and his henchmen were also hatching a plan to assassinate Bud Frazer upon his return. The plan was to stage a shoot-out on the railroad station platform when the sheriff returned. Nearby, would be a third man who would shoot Frazer, making it appear as if he had been killed by a stray bullet. However, when a man named Con Gibson overheard the plan while in a local saloon, he contacted Frazer to let him know about it. Frazer, in turn contacted the Texas Rangers, and when Frazer arrived, he was flanked by Texas Rangers. Captain John R. Hughes soon arrested Miller, Clements and Martin Hardin. The three were indicted on September 7, 1893 for conspiring to kill Frazer. The case was transferred to El Paso to be tried; however, the witness, Con Gibson, the primary prosecution witness fled to nearby Eddy (now Carlsbad,) New Mexico, where he was shot and killed by Miller henchman, John Denson. With their witness gone, the state was forced to release the three prisoners. Though Miller had once more escaped the long arm of the law, he did lose his job of marshal, and bought a hotel in Pecos. Miller then appeared to be living the life of an honest citizen and the town settled down. However, word began to spread that Frazer couldn’t handle Miller and had no business being sheriff. The talk naturally built up resentment in the young sheriff. On April 18, 1864 when Bud Frazer encountered Miller on the street, he yelled at him “Jim, you’re a cattle rustler and murderer! Here’s one for Con Gibson.” Frazer then opened fire on Miller, striking him in the right arm near the shoulder. Miller fired back but succeeded in only grazing a man named Joe Kraus, a local store keeper. Frazer then emptied his pistol into Miller’s chest and he collapsed. Bud then walked away only to find out later that, amazingly, Miller wasn’t dead. Several of his friends picked up Miller and carried him into his hotel. Also surprised that the man wasn’t dead, they discovered a metal breast-plate plate that Miller wore under his coat. Now, it became clear why the hired killer always wore a heavy frock coat. However, that information would not be shared with Frazer. Though Miller survived, he would spend the next several months convalescing and there were no more conflicts between the two men, though Miller had been making threats the entire time. In November, 1894, when the sheriff election came up again, Frazer lost. He then moved to Carlsbad, New Mexico, where he opened a livery stable. Frazer returned to Pecos the next month to settle his affairs. The ex-sheriff encountered Jim Miller in front of Zimmer’s blacksmith shop on December 26, 1864. Having heard the frequent threats that Miller had made against him, Frazer drew his gun, sending two shots into Miller’s right arm and left leg. Jim then began firing left-handed, without success, while Frazer sent two more slugs into Miller’s chest. Amazed again that Miller was still alive and standing, the confused Frazer fled. It was only later that the ex-sheriff would find out about Miller’s protective breast-plate. In March, 1895, John Wesley Hardin, who had become an attorney while in prison, arrived in Pecos and filed charges of attempted murder against Bud Frazer. The ex-sheriff’s trial was scheduled to be heard in El Paso. However, Hardin was killed before it came to trial and Frazer was acquitted in May, 1896. Miller, of course was furious and in the end, would take his final revenge. Bud Frazer was not Miller’s only target. Barney Riggs, Bud’s brother-in-law, hard-case gunfighter, and the man who had exposed Miller’s thievery while he was a deputy, was also in Jim’s cross hairs. 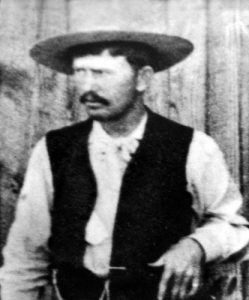 Riggs was also said to have been the only man that Killer Jim Miller ever truly feared. In typical fashion, Miller decided that Riggs should also die. In early 1896, two of Miller’s henchmen — John Denson and Bill Earhart were overhead in Fort Stockton,Texas muttering threats against Barney Riggs. Later, the pair left for Pecos, Texas to seek out Miller’s nemesis. However, U.S. Deputy Marshal Dee Harkey wired a telegram of warning to Riggs and when the pair arrived, avoided them. However on the morning of March 3rd, as Riggs was substituting for a friend as a bartender in R.S. Johnson’s Saloon, he was alone. Denson and Earhart burst into the room and a shot from Earhart grazed Barney, who instantly fired back killing the other man. He then grappled with Denson before the would-be assassin was able to flee. Riggs followed and as Denson was running down the street, Riggs shot him in the back of his head, killing him on the spot. Miller’s scheme to eliminate the one man he feared had failed. After the shooting, Riggs surrendered himself. He was later tried for murder and acquitted. In the end, almost every character involved in this feud would also end up dying in a violent manner. John Denson and Bill Earhart were killed by Barney Riggs in Pecos, Texas in 1896. Riggs was later killed by his step-son-in-law in 1902 in Fort Stockton, Texas. On December 29, 1908, Emmanuel “Mannie” Clements, Jr was shot and killed in an El Paso saloon. Jim “Killer” Miller was hanged by vigilantes in Ada, Oklahoma on April 6, 1909.